The litany has been repeated so often that it's easy to recite: The walls are closing in on Donald Trump, person x or y or z is going to bring him down, it's only a matter of time before he is caught or exposed or loses his base of support and driven from public life. The phrases sound out from our cable channels. We see them in newspaper headlines and in our Twitter timelines. This time Trump has gone too far. The end is near. Take that, Drumpf! What is forgotten is that the president has operated in this atmosphere of emergency and crisis and imminent doom since he announced his campaign. No matter how dire the outcry, he moves on. His political standing remains stable. At the end of last week, after Manafort and Cohen, after Trump found himself on the receiving end of the reality politics playbook, NBC News and the Wall Street Journal polled his job approval. There was no appreciable change. Why? The most important reason has to be the remarkable state of the American economy. On Election Day 2016, the Dow Jones Industrial Average closed at 18,332.43. On August 29, it closed at 26,124.57. That is an increase of some 40 percent. Other indices show similar gains. Growth in GDP went from 1.5 percent in 2016 to 2.3 percent in 2017 and, helped by the excellent 4.2 percent number in the second quarter, is forecast for around 3 percent in 2018. The jobs engine is humming. Unemployment is at 3.9 percent, with record lows among minorities. Workers say they are satisfied with their jobs at the highest rate since 2005. For good reason: Both median household income and per capita disposable income are at all time highs. Consumers are spending. Confidence is near an 18-year high. According to the Harvard-Harris poll, 85 percent of blue-collar workers say things are headed in the right direction. The fact that presidents are not responsible for the economy does not stop the public from assigning them blame or credit. And Trump deserves some credit. His pro-business attitude stirs the bulls' animal spirits. His deregulatory and tax policies contribute to growth. Trump understands that he is riding the bull—and that his following will be strong for the duration of the journey. That's why Trump doesn't want the Federal Reserve to tighten interest rates. Like all populist leaders, he is fond of debt and inflation. These economic stimulants boost his political coalition. If Jerome Powell and company raise the federal funds rate too quickly, the economic gains of the first half of Trump's presidency could unwind. 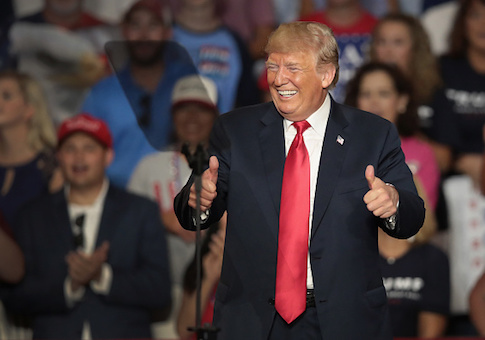 The other promises Trump has kept to his voters—nominating constitutionalist judges, supporting Israel, cracking down on illegal immigration, promoting Second Amendment rights, rebalancing global trade—might not matter. As the saying goes: When the economy is the issue, it's the only issue. The economic boom is crucial in understanding why Trump enjoys the 88 percent approval among Republicans that keeps him politically viable. There are other factors too. Recent days brought two of them into sharp relief. Trump continues to goad, highlight, and benefit from an antagonistic news media. The overwhelmingly negative coverage of Trump paradoxically works to his advantage by driving his supporters to rally to his side. When the press gets a story wrong, Trump is vindicated. His voters have less reason to trust the elite media institutions they see as allied against them in a struggle over American identity. CNN may well have reasons to stand by its story that the president had advance knowledge of the 2016 meeting with Russians in Trump Tower. It's embarrassing that the network has refused to share those reasons after Michael Cohen's lawyer Lanny Davis revealed himself to be the anonymous source for the story and recanted his statement. Media obsession with Trump and scandal helps the president in other ways. For one, the scandals are confusing and increasingly self-referential. Only political professionals and junkies can keep track of them. The headlines run together. The talking heads are background noise to men and women outside the bubble. The media fixation hands Trump the initiative. Because so much of the news is based off of his Twitter feed, he can create storylines, and spark confusion and outrage, with the push of a button. This ability lets him shift attention from current controversies by creating fresh ones. The ongoing hysteria lessens the cost to Trump of each bad story. It also allows him to portray media institutions and figures as insiders contemptuous of Trump voters and eager to overturn the result of a presidential election. Trump survives not only because of the economy but also because of his opposition. He benefits from media bias as well as the lack of a credible Democratic alternative. If Democrats are associated with socialism, abolishing ICE, and single-payer health care, Trump lives to fight another day. Democrats—and most Republicans for that matter—have yet to grasp the ideas of political economy that Trump intuits: government that privileges American citizens through tight-labor markets, border security, trade reciprocity, and entitlements. Nor do Democrats understand that American populism is not simply economic. It is cultural. It has long been associated with traditional values and practices, an unreconstructed patriotism, and support for law and order. No matter how well Democratic proposals might test, the party will not succeed at the national level unless it addresses and mollifies the social concerns of the white working class. Pelosi, Schumer, and Sanders have not tried. Maybe one day they will. Change the economy, the news business, or the Democratic Party, and the president's in trouble. Until then, Trump will be Trump. And will live to fight another day. This entry was posted in Columns and tagged Democratic Party, Donald Trump. Bookmark the permalink.